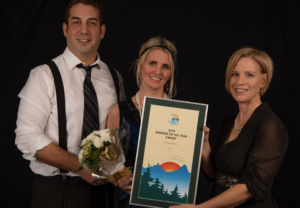 Budget Blinds of North and Central Vancouver Island was recently recognized as the Comox Valley Chamber of Commerce Business of the Year. This local Vancouver Island business and their Comox Valley-based owners were honoured for their commitment to the community. If you’ve been putting off getting new window blinds or shades, hoping for a great deal, wait no more! 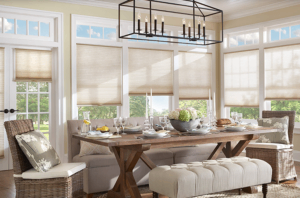 Budget Blinds of North and Central Vancouver Island has their biggest sale of the year in February, with 50% off Enlightened Style and Signature Series window coverings. The Signature Series from Budget Blinds offers the latest on-trend options, with new products released every year. Choose from solar and roller shades in a variety of fabrics and colours, or choose sliding panels for large windows or patio doors. The New Year is a great time to bring new decor into your home! 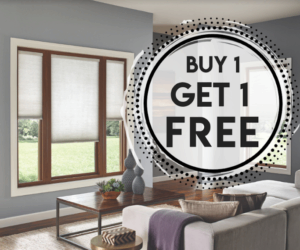 Find your home’s new look with the latest window fashions and take advantage of “buy one-get one” offers on select products from Budget Blinds on Vancouver Island. New window coverings will both update the look of your home and can enhance privacy, energy efficiency, and safety. Improve your home’s energy efficiency with updated window coverings and find savings along the way. Sales in the Vancouver Island Real Estate Board (VIREB) area returned to seasonally normal levels in January after experiencing the busiest December on record. The Vancouver Island Real Estate Board (VIREB) has released its monthly sales report, showing sales returning seasonally normal levels in January after the busiest December on record. Higher interest rates and the new mortgage stress test are expected to erode purchasing power for some buyers in 2018. The British Columbia Real Estate Association (BCREA) notes that the housing market in B.C. is still thriving due to the province’s strong economy. However, some economic headwinds in the form of higher interest rates and Guideline B-20 – also known as the mortgage stress test – are forecast for 2018. BCREA expects economic growth in the province to slow this year, expanding at a respectable 2.8 percent, but lower than we have seen in some time. Rising interest rates will erode affordability for some home buyers, and Guideline B-20 could reduce the purchasing power of conventional mortgagors by up to 20 percent. Last month, the benchmark price of a single-family home in the Campbell River area hit $379,600, an increase of 22 percent from the previous January. In the Comox Valley, the benchmark price was $463,700, up 17 percent from last year. Duncan reported a benchmark price of $418,600, an increase of 15 percent compared to January 2017. Nanaimo’s benchmark price rose 19 percent to $514,400 while the Parksville–Qualicum area saw its benchmark price increase by 14 percent to $519,700 from one year ago and dip slightly from December 2017. The cost of a benchmark home in Port Alberni reached $259,100, up 20 percent from one year ago. Excerpt from VIREB Press Release on Feb. 1, 2018. Need a Brookfield Relocation Agent on Vancouver Island? Call Comox Valley Realtor Tina Vincent! Do you need a Brookfield relocation agent on Vancouver Island? Comox Valley Realtor Tina Vincent is an experienced Brookfield specialist who can help with your military transfer or posting; RCMP transfer; or corporate move to the Comox Valley on Vancouver Island. As a Brookfield agent, Tina markets properties through a variety of platforms, such as the Multiple Listing Service (MLS); online, including on 1stView.ca and tinavincent.ca; and in print. She uses a savvy combo of traditional real estate services and modern, innovative marketing to ensure that each home receives maximum marketing exposure. Her vast knowledge of the local Vancouver Island real estate market helps buyers and sellers get the best value in their Comox Valley real estate transactions. One of Tina’s cross-country clients can attest to her relocation expertise. “I would like to thank Tina for the excellent service she provided for us,” says Beth White. “We were moving across the country and only had a short amount of time to find a house. She was very forthcoming when searching for property and very concise with the details of each of the listings that we were interested in.” With Tina’s help, Beth and her family found the perfect home. “Tina is truly a wonderful person to work with. I would happily recommend Tina Vincent to anyone looking for property in the Comox Valley,” says Beth. As your Comox Valley Connection, Tina works with home buyers and sellers in Courtenay, Comox, Cumberland, Campbell River, Parksville, and Qualicum Beach. In addition to her Brookfield specialty, Tina helps local buyers and sellers with their home sale or purchase. Call Comox Valley Realtor Tina Vincent at 250.792.2776 or visit tinavincent.ca.